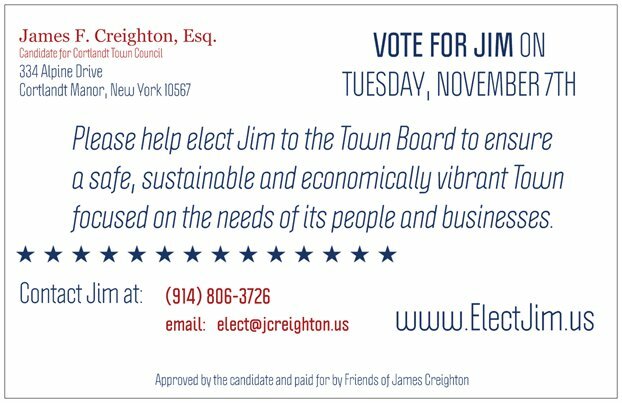 To help Jim and the team led by Supervisor Puglisi, please share your name and contact information so we can get in touch. It is critically important that we get out the vote for the election on November 7th -- please help us! You can help by talking to your neighbors, making phone calls and donating to my campaign. If you would like to help financially, you can make a donation -- your checks are welcome and should be written to "Friends of James Creighton"
While Jim appreciates all assistance you can give, please note that campaign contributions are limited to $1,403 per individual or corporation, and combined contributions for an immediate family are limited to an aggregate $7,015 per family. Every phone call, knock on a door and contribution helps, so please give what you can and show Jim that you support his fight to keep Cortlandt safe, sustainable and economically vibrant!